Plymothian Transit: Do drivers always know best? Do drivers always know best? Well I am back in Plymouth after a very successful course up in the big city of London. I would like to say it was a very relaxed trip with all the transport links working brilliantly. I would like too - but it wasn't all plain sailing. In fact to be fair most of it was excellent with the train journies both running exactly to time, with plenty of room and no problems whatsoever. The buses in London were brilliant with a great value day ticket for £3.50 and buses seemingly all running full all through the night. Even my few trips on the Tube were great with no problems at all. Sadly the one bit that let me down was right here in Plymouth. 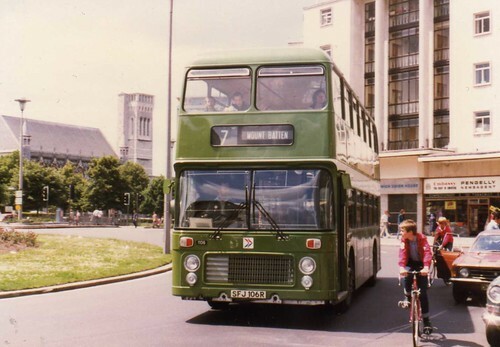 I had arranged to catch the 14:03 service 86 from Derriford Hospital as it stopped at Plymouth Station. This would give me plenty of time to get some lunch etc. before getting on the train. At 14:06 service 7 came in and sat at the bus stop for a few mins. Right behind it was the 86, just a few mins late. I stood behind the 7 and waved at the driver expecting him to pull in behind the 7. Sadly he decided I didn't need to catch his bus, and just pointed at the 7 and drove straight past. It was clear that he expected me to catch that one and not bother him. I was rather angry at this to say the least and had a good moan at the other driver who at least was still sat there. She tried to excuse the driver by saying that they both went the same way anyway so it wasn't a problem, until I pointed out that she didn't go the the station - then she understood why I was angry. I did catch my train on time, but only after a 15 minute dash down from North Hill leaving me no time for a wander around the station shops. Not a good start to the trip! I will be sending in a complaint as it did make me very angry and was totally needless as the driver of the 86 was only a few mins down and could have stopped quite easily - I would have been the only passenger getting on and I had a pass so no need for the driver to stop and count out cash and issue a ticket or anything. Like I said, everything else that First ran for me over the days went brilliantly and I will be posting a few photos during the week when I get chance to process them. In the meantime here is another one of aecregents excellent photos he has posted on Flickr. If this one had turned out on the 7 I probably wouldn't be complaining about having to catch it!